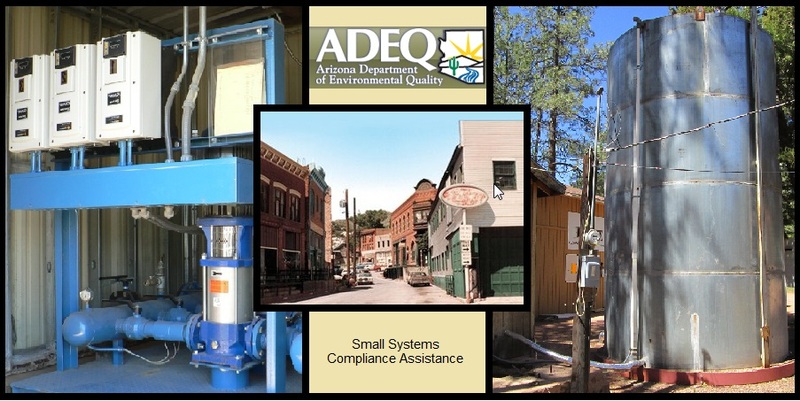 ADEQ provides a compliance assessment package for community, non-transient/non-community and transient non-community water systems to further assist public water systems in tracking their compliance status and to assist in scheduling required water testing. For more information, please visit our Safe Drinking Water Program Overview page. The Arizona Drinking Water Rules require community water systems to produce Consumer Confidence Reports annually and submit them to ADEQ by July 1st. The rules are located in the Arizona Administrative Code, Title 18 Chapter 4 Article 1 (R18-4-117). The Consumer Confidence Report (CCR) needs to describe a number of items such as the source of the water, levels of contaminates found, the possible source of these contaminates and the corrective actions taken, mandatory language regarding the health effects, other information about your water system and the quality of the water your system delivers to your customers. Every day in Arizona, over five million people are provided with potable water from approximately 1,550 regulated public water systems (PWS). The vast majority of these regulated PWSs provide drinking water that meets all state and federal primary (health-based) drinking water standards. While this is commendable, over 50 PWSs fail one or more health-based standards and/or neglect to conduct all required compliance water monitoring to ensure water served to people is potable and safe for consumptive uses. These non-compliant water systems sometimes do not maintain adequate managerial, technical and finandcial capabilities and may not manage the systems sufficiently to maintain baseline maintenance and operation costs to undertake needed infrastructure repairs and upgrades. There are approximately 1,400 small PWS in Arizona (small = serves less than 3,330 persons each day) with a subset of 1,130 very small PWSs that serve less than 500 persons daily. A disproportionate number of these small and very small PWS violate one or more health-based drinking water standards and because of their lack of managerial, technical and/or financial resources, these small water systems present the most challenging compliance issues to state and federal regulators. Compounding the matter, the regulatory standards for PWS have grown increasingly complex and more stringent. The purpose of this Small Water System Compliance Project (Project) is to define the specific financial and technical assistance tools available for these PWS and to partner with co-regulators and technical/financial assistance providers (e.g., Arizona Corporation Commission, U.S. Environmental Protection Agency, Maricopa County Environmental Services Department, Pima County Department of Environmental Quality, Water Infrastructure Finance Authority, Rural Water Association of Arizona, County Governments, etc.) to assist PWS willing to correct unresolved deficiencies. Additional tools such as formal enforcement or monetary penalties, will be applied in cases where a PWS is unwilling to move in the direction that protects public health. This comprehensive approach will address the specific violations and reduce the number of primary drinking water standard violations in Arizona. This Project is concentrated on small PWS that have the most pressing compliance issues caused by recent water quality and/or failure to monitor violations. It focuses on addressing these violations while continuing ADEQ’s routine regulatory oversight work to prevent new violations. The Water Infrastructure Finance Authority (WIFA) is Arizona’s water and wastewater funding source. WIFA is dedicated to maintaining and improving water quality for all Arizonans by providing financial and technical assistance for basic water infrastructure. Through low-interest loans and subsidies, WIFA is able to save its customers a significant amount of money. Utilizing water and wastewater state revolving funds, WIFA offers loans and grants for drinking water and wastewater projects designed to ensure safe, reliable drinking water and proper wastewater treatment. Since its inception in 1992, WIFA has invested over $2 billion dollars in Arizona. Training-RWAA provides conferences, classroom programs, seminars, webinars, online courses, and on-site training opportunities to members, which are designed to keep water and wastewater professionals abreast of the latest methods of efficient operations and management techniques. This tool gives facility operator(s) and manager(s) instructions, log sheet samples, and technical information for efficient and safe operation of a facility during normal operations or during an unplanned/emergency situation. An O&M Manual may also be used by emergency responders for reference regarding such items as chemical storage and fire flow capabilities. Creating your O&M Manual will be much easier using this “electronic” template which allows you to insert your system’s specific information in the spaces and tables provided. The template may also be printed and completed by hand using Appendix 14: Instructions for Template. Email [email protected] with any questions regarding this template. A full list of RWAA contacts can be found on the RWAA website. A tailored asset management plan. Basic Information - Get answers to frequent questions about CUPSS and learn how CUPSS is designed, how it works and what it can do for you. Case Studies - Read about the experiences of small drinking water and wastewater utilities as they take on the challenge of asset management. CUPSS Software - Download a copy of the CUPSS application or request a copy of the installation CD. You can also register as a CUPSS user to receive updates and notification of training opportunities. Resources - Find help as a CUPSS user or trainer in the form of CUPSS documentation, useful websites and promotional material. Training Events - Find training events in your area and sign up for upcoming EPA webcasts. The Arizona Rural Water Infrastructure Committee (RWIC) is a partnership of various federal and state agencies who provide loans, grants and technical assistance to state’s rural communities. RWIC serves as a “one-stop shop” for rural communities with a population of less than 10,000 and is designed to help meet the needs of small drinking water and wastewater systems throughout Arizona. If you need technical or financial assistance, fill out the RWIC project information form. During the meeting, RWIC partners will provide you with project specific information on the funding or assistance their organization has to offer. For more information, please contact ADEQ's Drinking Water Monitoring and Protection Unit.